RPM -THE Pro Turntable Toolkit app: insight & download. Test the RPM and wow/flutter accuracy of your turntable, whether 16, 33 1/3, 45, or 78. Full functionality, no ads or in-app-purchases. RPM is proud to be recommended by Rega Research Ltd, maker of some of the finest turntables in the world. See the speed variations, wow/flutter, of your turntable in real time graphics like you've never seen before, continuous display makes it easy to make adjustments as necessary if your turntable allows it. 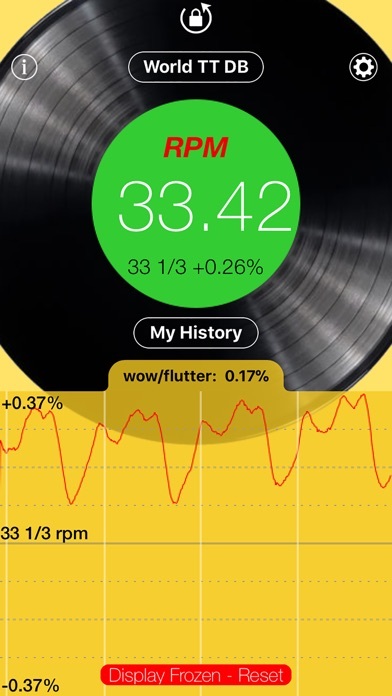 RPM is the ONLY app which shows a realtime chart of your turntable's wow/flutter variations. There are many ways of testing the average RPM of your turntable, many turntables even have this built in, however there is no other practical way of showing the wow/flutter variation over time than RPM. The graphs kicks in when the rpm accuracy is better than +/- 5% then autoscales to show maximum detail.